So USA TODAY trots out an old story about the death vans in China. Jinguan — "Golden Champion" in Chinese — lies an hour's drive from Chongqing in southwestern China, below the green slopes of Cliff Mountain. Along with the death vans, the company also makes bulletproof limousines for the country's rich and armored trucks for banks. Jinguan's glossy death van brochure is printed in both Chinese and English. 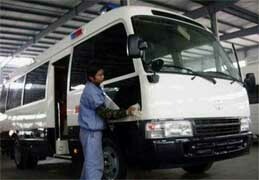 From the outside, the vans resemble the police vehicles seen daily on China's roads. A look inside reveals their function. "I'm most proud of the bed. 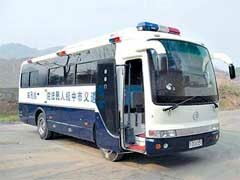 It's very humane, like an ambulance," Kang says. He points to the power-driven metal stretcher that glides out at an incline. "It's too brutal to haul a person aboard," he says. "This makes it convenient for the criminal and the guards." The lethal cocktail used in the injections is mixed only in Beijing, something that has prompted complaints from local courts. "Some places can't afford the cost of sending a person to Beijing — perhaps $250 — plus $125 more for the drug," says Qiu Xingsheng, a former judge working as a lawyer in Chongqing. Death-by-gunshot requires "very little expense," he says. There are in fact variations of the death van. The photo used in USA TODAY is a public relations photograph and has only the marking "Court of Law" on the outside. 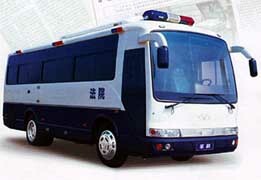 The photo below on the left (from Dayoo, 2/22/2004) marked it as "Zunyi City Middle-Level Court: Penal Vehicle." The photo on the right below (from EastDay 2/26/2004), this is a different make and has no identification. What is inside of the van? 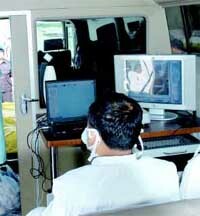 The photo below on the left (whnews.com 7/29/2005) shows some computer equipment used to monitor vital signs. 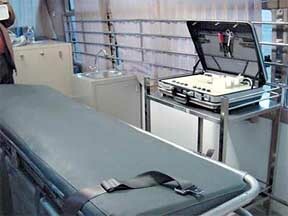 The photo in the middle (from Dayoo, 2/22/2004) shows the bed with the straps and the injection equipment. The photo in the right (from EastDay 2/26/2004) shows the subject being loaded into the van and said to be accompanied by the sound of music to sooth his nerves. - On August 18, 2002, he went to a relative's place; seeing that she was alone at home, he raped her and took her money. - On November 7, 2002, he went into a store, stabbed the owner to death and took 350 RMB in cash. - On May 23, 2003, he had a 'transaction' with a prostitute; since he had no money to pay her, he strangled her and took 11 RMB in cash plus one mobile phone. Q: What do you have to say to your family? A: I don't have anything to say to them. I feel sorry for them, and I feel sorry for the victims. Q: Why are you sighing? A: The three 'most' in my life: my most hated person is my father, my most hated thing is to be looked down upon and my most regret is towards my victims. Q: Do you think you ought to die? A: I ought to die. I just hope that the process is straightforward. At 9:50pm, Zhang was taken to the execution field. At 10am, he was placed on the bed. At 10:06am, the executioner pressed the buttons to initiate the injection. At 10:08:10am, the instruments showed that all vital signs have stopped. The medical doctor then pronounced Zhang dead. The process lasted 130 seconds. Caution: The above story was obviously selected to fit a certain propaganda message about the death penalty in China. There are other more controversial cases, such as The Case of Wang Binyu (王斌余). There are also other ways to carry out the death penalty, as in The Death Penalty in China - Part 2.